Looking for recommended reads? This is the time of year I am supposed to pare down my reading list and chose the favourites out of what I read. Which sounds like it would be easy. Some years I start with a blank slate and write the first ten books that came to mind. Other times I try to single out one book per category. Most of the time I can get to the top 20 fairly painlessly, but there are still books I SO want to recommend. I also go through the lists that have been compiled by the New Yorker or the New York Times or the prizes, see what I have missed. Often I think I am not well read at all. 10 of their hundred? And yet, there are well over 300 books I enjoyed last year. There has to be time for travel, gardening, sleeping, etc, doesn’t there? There’s still time to get a few of these for someone’s Christmas present! I dare say there are even a few in the Friends Bookstore! What are my best books of 2014? My 25 personal favourites in fiction and non fiction. Obviously the more Stars the more I loved it. Enjoy a wee nip to keep the cold at bay while perusing the latest Library book, or Friends’ Bookstore Find! Remember that Andy’s Crossroads and NE Stores have Balvenie Double Wood and 15 yr Single Malt Whiskies for sale during December and that a portion of the proceeds ($5) of each bottle benefits the Rochester Public Library. You still have 11 days left of this month! Remember that we are making a Library Collection of interesting wines, with wonderful labels for the next few months. 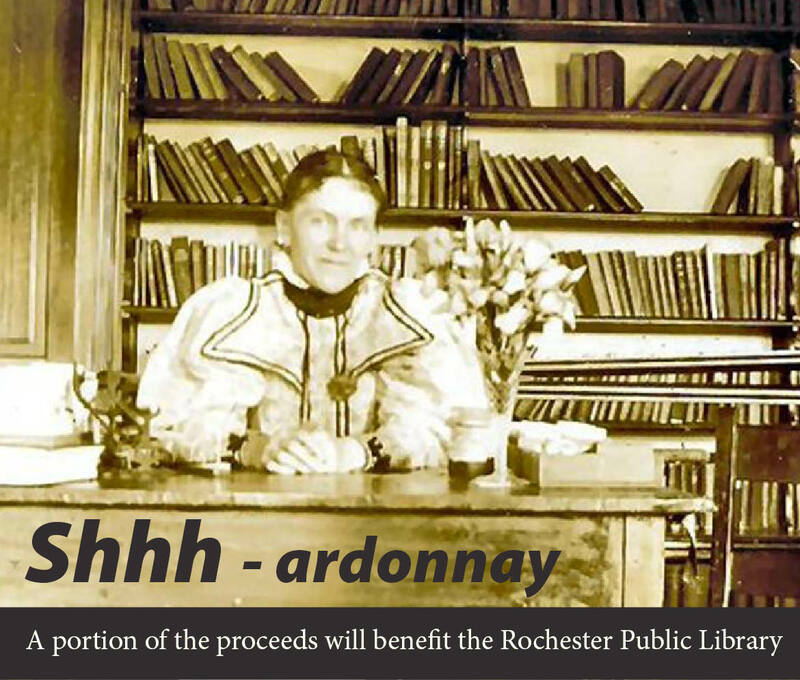 The Favourite so far is SSShhhhhh ardonnay, with an outstanding photo of one of our first librarians! I personally like Well Red, on either the Merlot or the Cabernet. Pair it with your favorite book for an outstanding gift. Enjoy a wee nip to keep the cold at bay while perusing the latest Library book, or Friends’ Bookstore Find! Remember that Andy’s Crossroads and NE Stores have Balvenie Double Wood and 15 yr Single Malt Whiskies for sale during the Month of December and that a portion of the proceeds ($5) of each bottle benefits the Rochester Public Library. AND Remember that we are making a Library Collection of interesting wines, with wonderful labels for the next few months. The Favourite so far is SSShhhhhh ardonnay, with an outstanding photo of one of our first librarians! I personally like Well Red, on either the Merlot or the Cabernet. We will consider personalised labels for orders of a case or more. 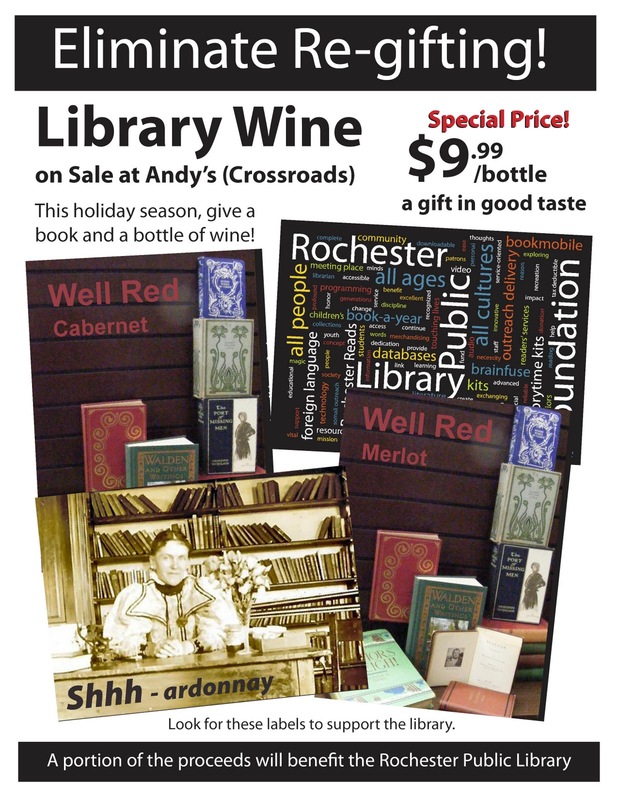 A local Book Club decided it was the perfect gift for members and created a label with “reading between the wines”. Due to the inclement snowy weather last weekend, we closed the bookstore. Do not despair! We moved the Book Sale to THIS next Saturday December 18th so you can still find the perfect book gift! We have a wonderful selection of Gift Quality Books for our Second Saturday Sale, in the Friends’ Bookstore and Library Foyer. Join Paige Turner in selecting a great holiday read! I will soon be posting my annual reading list, with recommendations, so check this space! Books make Great Gifts because they appeal to almost everyone; they’re affordable, shippable and wrap-able; and they complement the fine taste of the giver as well as the receiver. There’s something for everyone, including yourself. 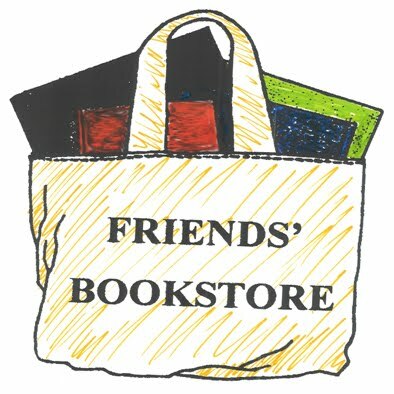 VISIT THE FRIENDS’ BOOKSTORE SOON for the perfect gift. Remember, December is “Read a New Book Month”! 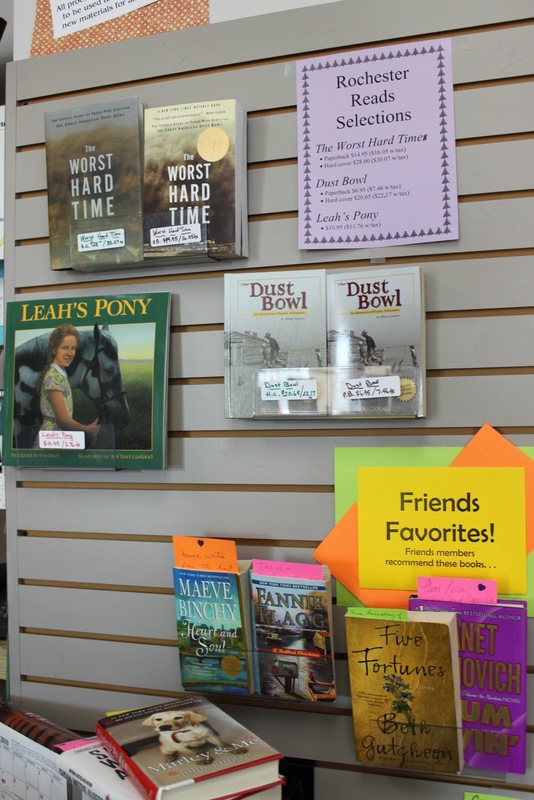 We know that every month is for our Friends Bookstore Readers, but since it is now official, we may as well CELEBRATE! 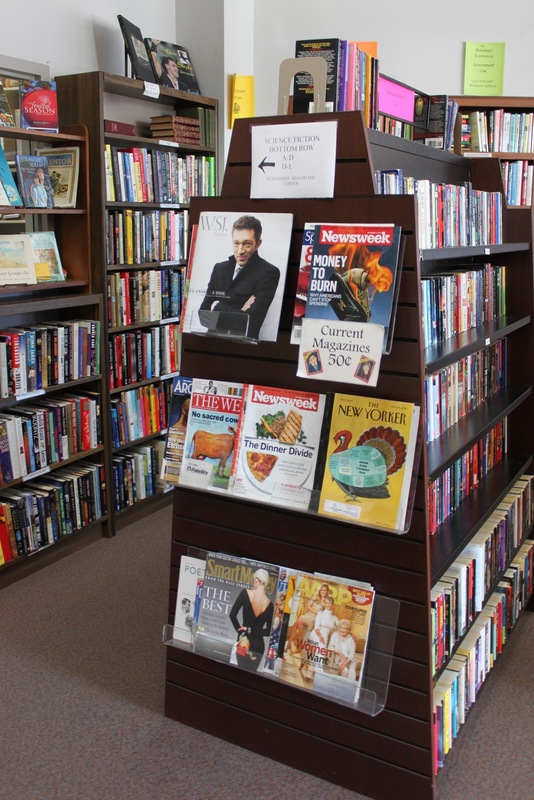 Come into the Bookstore for great book suggestions and a great selection of holiday gift ideas. Don’t know what to get someone for the Holidays? 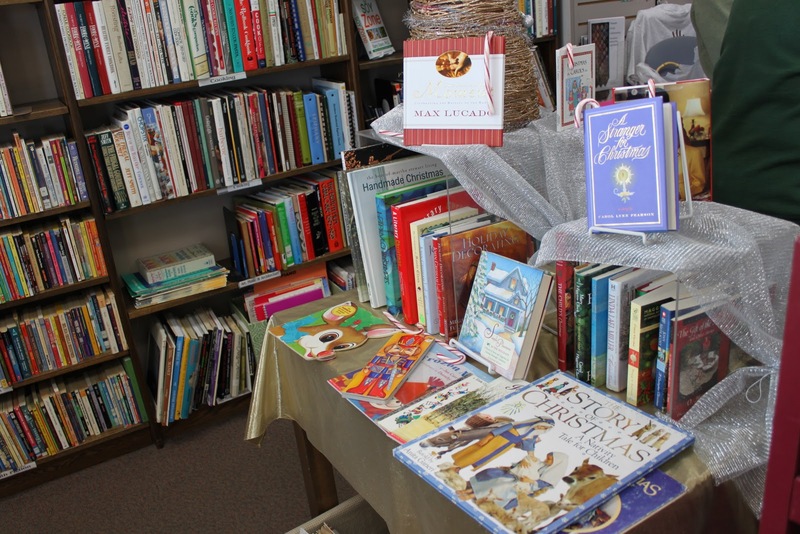 A BOOKSTORE GIFT CERTIFICATE is a great idea!! Be an ELF** and support the Rochester Public Library! *An ELF is an Extraordinary Library Friend! 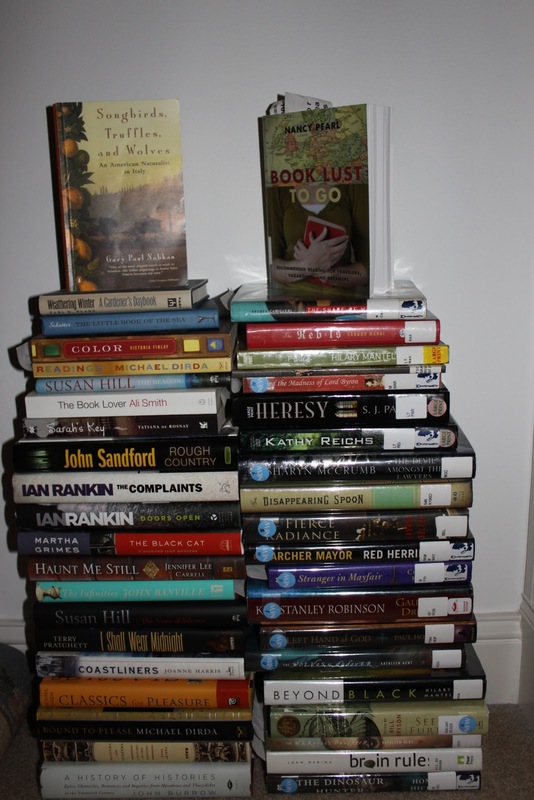 It is a busy holiday season, yet I have STACKS of books to read. Literally. The Stack on the right has to be read soon, as they are library books! There are only 16 to read in the space of 15 days 😉 Unusually for me, I am reading several at a time. That happens with non fiction, but also with Book Lust to Go (Nancy Pearl) you end up reading 2 pages, and getting 6 more books….So do I buy Book Lust to Go in paperback or on Kindle?? The Book Stack on the left has accumulated over the last three months, when travel enlisted virtual reading. Many of these were purchased in the Friends’ Bookstore, where you can often find books in mint condition, for a fraction of the price. Winter is the Perfect READING Season, and it is delightful knowing I have the next book all set to go. Of course, I have an enormous wish list too!